Coyotes kill a lot of deer. Studies have shown that up to 74% of the fawns in some areas are eaten by coyotes. Here’s what you can do about it on your hunting area. In the first part of this two part series we looked at the affects of coyotes on deer populations and their effect on hunting. The results are quite shocking as we discovered several studies which show alarming mortality rates of fawns due to coyote depredation. We also learned that coyotes are very mobile and fill in the vacant areas quickly so control must be consistent and as widespread as possible. Coyote control simply means killing as many as possible. Harsh as that may sound, you can’t kill them all, and the remaining coyotes are less susceptible to disease which they might pass on to other animals, so killing some of them is good for the entire ecosystem as a whole. Plus trapping is a good excuse to get outdoors and learn more about the world around us. And good quality coyote pelts are worth going after. They will definitely pay for your gas and equipment at the least. Coyotes are notoriously difficult to trap if specific precautions are not taken. The coyote has the entire world to roam, and you must make him place his foot into a one-inch circle. Not an easy task, for sure, especially when you consider their amazing ability to smell your presence. Scent free tactics are imperative. Their Achilles heel is their curiosity. They smell fresh urine or scent from another canine and they just have to check it out. Scent post sets and dirthole sets are the two most common trap sets for catching coyotes because they take advantage of this chink in their armor. These sets take advantage of the coyote’s propensity to pee on any unusual object. A scent post set is placed near any outstanding feature that a coyote might see as a place to mark. It might be a corner post, a single corn stalk at the corner of a field, a rock or even a tuft of grass that looks out of place. A trap can be buried near these with dirt sifted over it and some fresh lure. Dirthole sets are simply a small hole with a bit of bait in it with a trap set in front. Lure is also used to call the coyote to the area, and when he puts a foot out to hook the bait out of the hole, you have him. For more specific details on how to make these and other coyote sets, check out YouTube videos on trapping or visit the forums at trapperman.com, where the regulars there are always willing to help out a beginner. Catching coyotes in snares is one of the most effective ways of controlling them, especially in the winter when their fur is prime and their movements are somewhat predictable. Trails develop in the snow and catching a coyote can be as simple as hanging a snare over the trail. I pile trimmings and bones from deer I have shot along with carcasses from other animals I have trapped to make a bait pile and the coyotes are soon regulars at the bait. Trails develop like the spokes of a wheel and the snow shows me where to hang the snares in the narrow, necked-down areas of these trails. Snares should be about 10 inches in diameter and about 6-10 inches off the ground. They must be mounted so they are rigid about the snare lock so they close quickly and firmly. Most coyotes will be caught around the neck and die quickly and humanely as they tangle on the nearby brush or saplings. 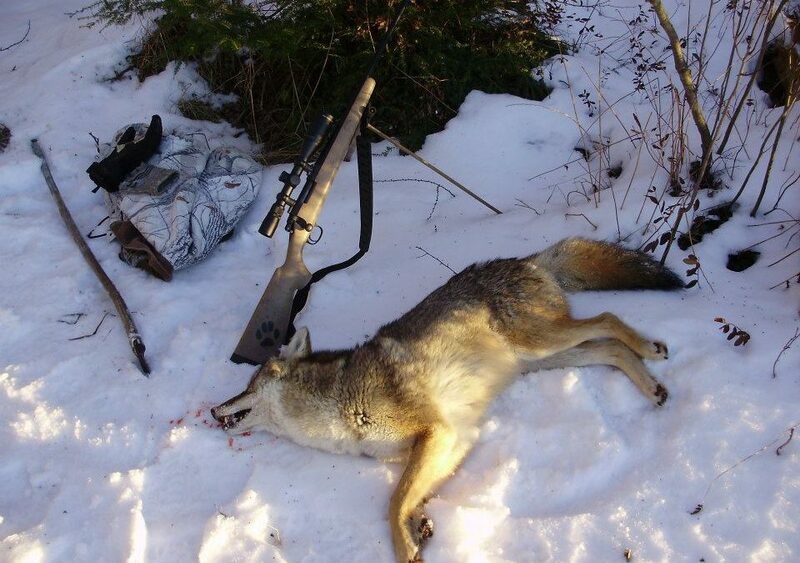 Getting out and calling coyotes to the gun is a favorite sport among hunters across the nation. 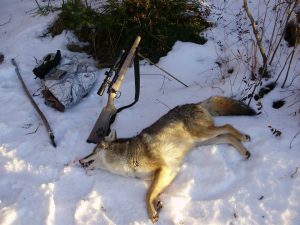 It pays to spend some time practicing and learning from instructional books, videos or a mentor before tackling this challenge or you may just educate the coyotes in your area and make them harder to kill. Setting up with the wind in your favor is key to being successful. 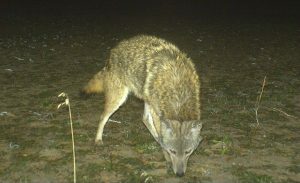 Most callers start out with a locating call of some sort, like a young coyote howler for example. If you get a response to the howler, start a dying rabbit scream and be ready for some action. They may come in hard and fast or they may sneak in so you have to be ready for anything. Guns such as a .223, .22-250 or .243 are common choices, and some callers use shotguns in thick cover. Calling coyotes is packed with adrenaline and it is effective. But once you call one and don’t shoot it, they wise up quickly, so do it right the first time. If you do not have the time or the inclination to kill the coyotes on your own, it’s most likely not too hard to find someone to do it for you. There are active trappers across North America and most are willing to come and trap for free during the prime fur season if the pelts are worthwhile. During the off season or in areas with poor fur quality, you are going to have to pay them some gas money or offer a bounty. In most cases, trappers will agree to take coyotes if you also allow them to set raccoon, mink, bobcat, fox or beaver traps as well to make it worth their while. Get to know their needs and you can build a relationship that will benefit everyone involved. Make sure you communicate closely with them about the rules of your property or you may have them coming through to check traps when you are in the treestand. Trapping season is hunting season so make sure you make prior arrangements as to trap checking times. Coyote control is a long term endeavor. You must do it every year and get as many as you can. It can be hard work, but studies have consistently shown that reducing coyote populations can significantly increase your fawn survival rates, and one of those fawns may be the next big buck you hang on your wall. I have found snares to be more effective than traps, they don’t freeze as easily so they don’t have to be reset during the season. Coyotes and deer use the same trails so I’ve learned not to set snares under oak trees to avoid snaring deer looking for acorns. 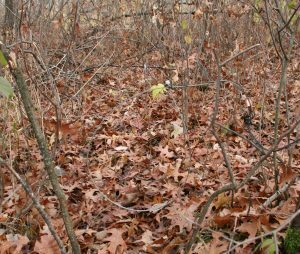 Using deer stops in the snare loop will help avoid snaring a deer’s leg and I only set snares in the winter to avoid fawns. In PA we can only use cable restraints not snares and the restrictions/laws using them make it tougher to be more effective. I would love to see some of these laws lifted to give the trappers better success in removing coyotes.